Volume Discount: Looking to make a large purchase? Please contact us and ask for a quote today. 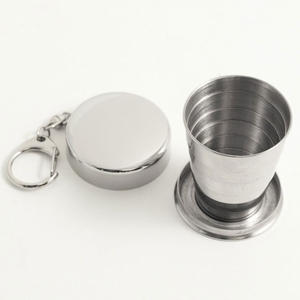 This stainless steel Collapsible Shot Glass Keychain is a unique gift idea. It features a stainless steel collapsible travel shot glass on a key chain. You can take it anywhere you go and always have a shot glass ready to use, or give it to a friend as a classic drinking gift idea for a 21st birthday. The collapsible shot glass is ideal for a groomsmen gift, business associates or friends. The travel shot glass keychain is also useful for cross country travel. It is durable and made of real stainless steel so it retains it shine and won't scratch. The travel shot glass collapses into a small ring that can be fit in your pocket. It stores easily in a backpack or toiletry bag. Discrete, and easy to carry it is also a classic gift. The collapsible shot glass is an excellent gift for those traveling across Europe or the united states. The shot glass keychain is also a fun groomsmen gift idea. This unique travel shot glass is also available for a bulk purchase at a discount. Order it for your entire wedding or company. The travel shot glass keychain is very unique and affordable drinker's gift idea. The Collapsible Shot Glass Key Chain is ideal for college students, salesman or anyone else who wants a very unique and authentic drinker's key ring and fine gift idea. Click to remove an item from recently viewed. Remove all items. Copyright 2012 Smith Family Stores, LLC. All rights reserved.